Not many industries could compete with railroad companies after the Civil War through the early 1900’s. Railroads had reputations for using their power to price-gouge farmers, for otherwise being ruthless and greedy, and for having a wanton disregard for public safety. The public started pushing back with the Interstate Commerce Act of 1887, which was designed to regulate the monopolies that the railroad industry had enjoyed, and laws were also passed to require certain safety equipment on locomotives and cars. One such type of safety equipment was a “spark arrestor,” which was fitted inside smokestacks to prevent sparks, cinders, flames, and other flammable material from catching trackside brush and trees on fire. Smokestacks ballooned into their memorable shapes for larger and better-performing spark arrestors, until coal took over as the fuel of choice. 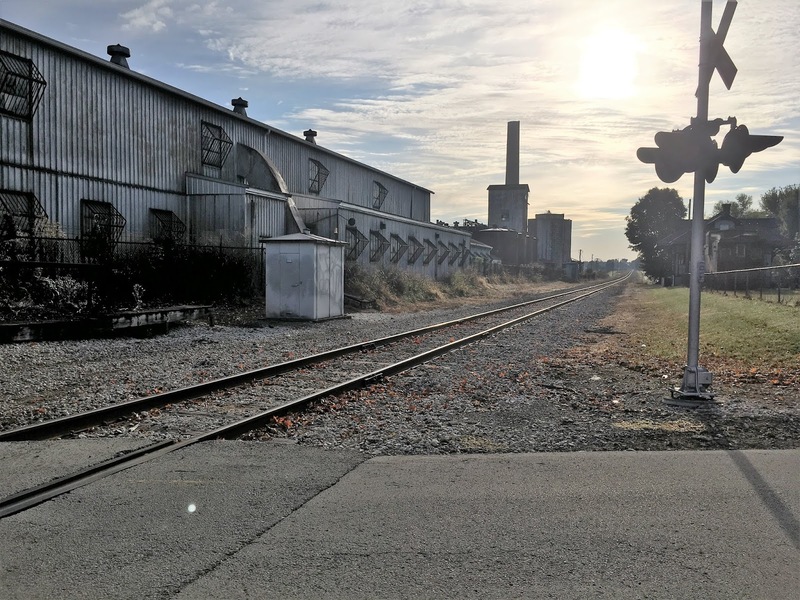 At the same time, by the late 1800’s, the bourbon industry was booming and industrial distillers exerted their own influence, at least in Kentucky, although the railroad industry was, of course, bigger and wielded more power and clout. The two titans came head-to-head when a Louisville & Nashville Railroad locomotive started a fire on June 9, 1897 at the original T.W. 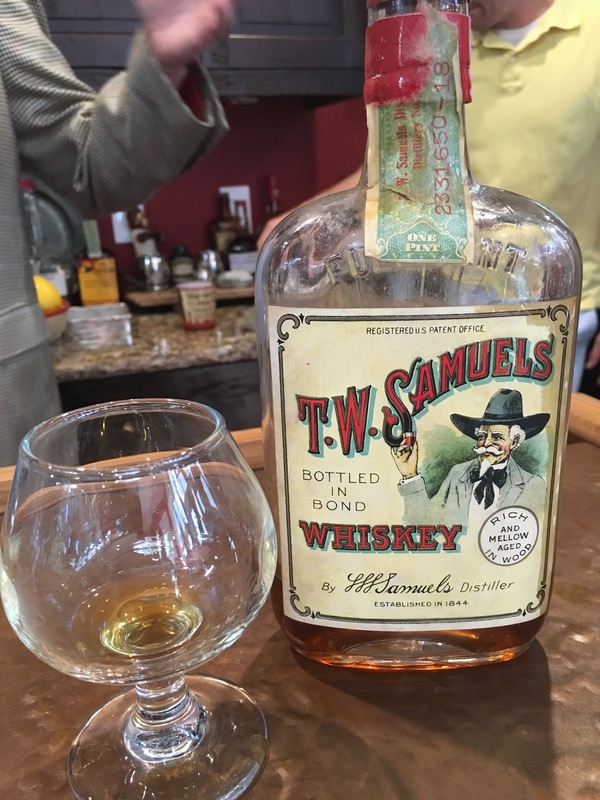 Samuels distillery in Deatsville, Kentucky, as recounted in Louisville & Nashville Railroad Co. v. Samuels’ Executors, 57 S.W. 235 (Ky. 1900). T.W. 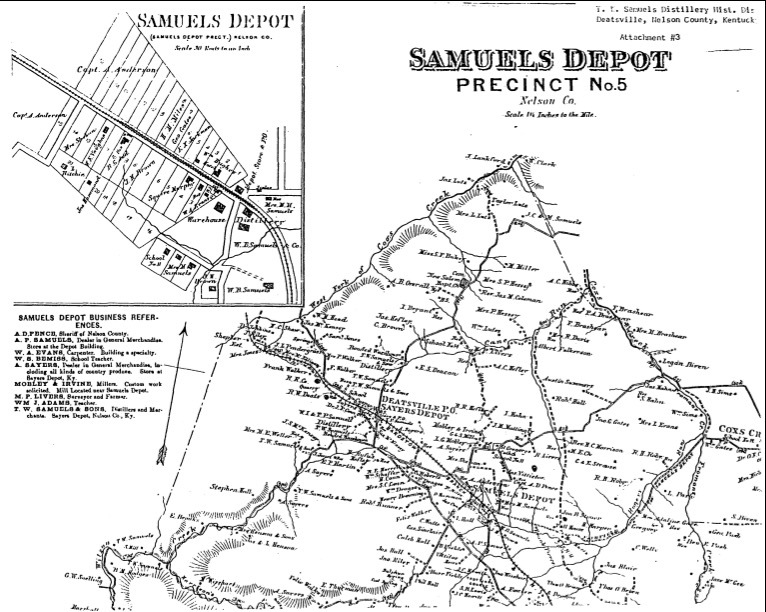 Samuels built a small warehouse at his distillery in 1866 at the edge of the railroad right of way, with a platform and roof extending over the right of way nearly to the track. In addition to storing barrels, T.W. Samuels also used this particular warehouse as a private depot (leading to the formal name “Samuels Depot,” which you can still find on maps today) for loading his bourbon and other goods onto trains. The court recognized that this small warehouse had become quite dilapidated and, in particular, at the time of the fire in 1897, the warehouse still had its original 1866 shingle roof. The L&N argued that the “frail and combustible” nature of the warehouse and its platform extension to the edge of the track made T.W. Samuels negligent and excused the L&N from any liability. In other words, never mind the fire-breathing locomotive—the burned warehouse was T.W. Samuels’ own fault. A Kentucky statute at the time protected railroad companies from liability for emissions of sparks if the locomotive at issue was equipped with the best available spark arrestor. The problem here was that the locomotive had a faulty spark arrestor—and it burned sacred bourbon—so the Nelson County jury awarded its verdict to Samuels. While T.W. Samuels’ neighbors in Nelson County ruled against the L&N, the Court of Appeals reversed and ordered a new trial. The Court of Appeals wanted the jury to consider the negligence of T.W. Samuels, not just the L&N. At the time in Kentucky (and across the nation), if a plaintiff was also at fault, recovery could be denied for his “contributory negligence.” This rule developed in England in the early 1800’s (Butterfield v. Forrester, 11 East 60, 103 Eng.Rep. 926 (1809)), made it across the Atlantic by 1824 (Smith v. Smith, 2 Pick. (19 Mass.) 621 (Mass. 1824)), and then inland to Kentucky by the early 1890’s (Newport News & M.V.R. Co. v. Dauser, 13 Ky.L. Rep. 734 (1892)), where it survived until the 1980’s (Hilen v. Hays, 673 S.W.2d 713 (Ky. 1984)). The Court of Appeals was eager to have the jury use this new rule that protected defendants (especially industrial defendants) by considering a plaintiff’s fault. There is no record of how the second jury ruled, but with the influence of bourbon in Nelson County, I’d put my money on the Samuels family. Perhaps not learning their lesson, the new T.W. Samuels Distillery built after Prohibition is almost as close to the L&N track as was the doomed warehouse. ← Kentucky Bourbon Affair – Music, Whiskey Science, and Country Ham at The Higher Proof Expo 2018. Thanks! You'd be surprised at the amount of historical case records that are NOT at the Kentucky State Archives because they were lost, damaged, or discarded. Some are misfiled too, so maybe the second case file survived somewhere. I hope so.